– Jerry Kalish, GFS®, President, National Benefit Services, Inc. If there were a way for every newborn child to retire a multi-millionaire, wouldn’t every parent want to know it? The concept is quite simple. From the moment the baby is born, you save $1,000 a year in a Child IRA until the baby’s 19th birthday. Then you do nothing. If that money is invested for the long-term and earns 8% (which is 3% less than the average 11% long-term return for stocks), then, when that child retires at age 70, the Child IRA account would have grown to two-and-a-quarter million dollars. Alas, there’s a catch. 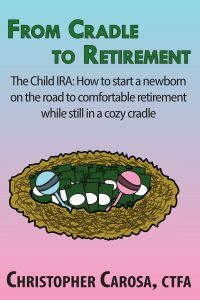 There is no such thing as a “Child IRA.” In reality, parents who create a Child IRA today must establish a traditional IRA, but there are restrictions which limit whether a child qualifies. Don’t you think parents want to know what they could do right now to allow their child to benefit from a Child IRA? Award-winning writer Christopher Carosa thinks so. A veteran financial journalist specializing in retirement plans and investments, he has interviewed hundreds of people involved in the retirement industry – from people saving for retirement to retirement plan service providers to state and government regulators. These interviews have produced hundreds of stories, articles, and reports published for national audiences by print and digital media outlets. His thoughts and opinions have been sought out and broadcast on various national TV and radio networks. 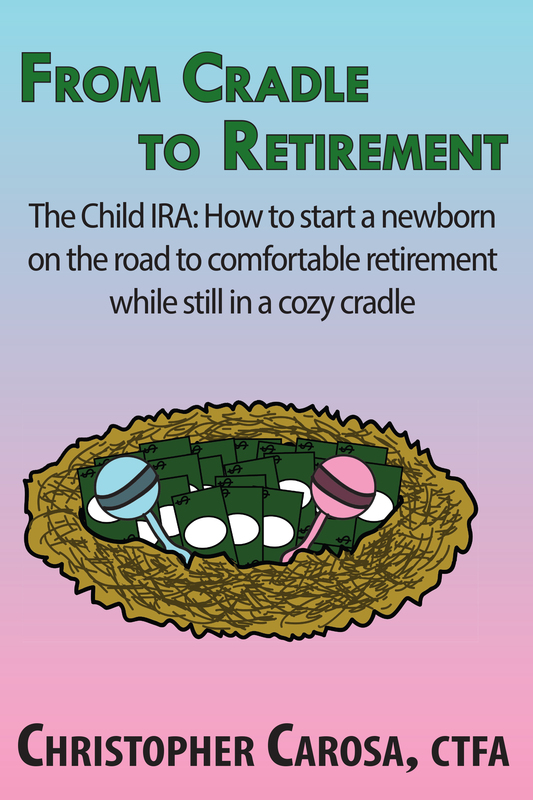 In From Cradle to Retirement, Carosa expertly pieces together these thoughts and interviews to reveal a practical “How-to” guide for parents, grandparents, and their financial advisers seeking to help young children reap the benefits of the Child IRA. Within this hands-on guide, Carosa weaves the fascinating history the cultural views of retirement in America and the implications these have had on public policy. Finally, and perhaps of greatest interest, Carosa reveals real-world case-studies of people who have created actual Child IRAs for their children. Still more case-studies show how parents have attempted to duplicate some of the Child IRA’s features with other savings vehicles. Would you like to benefit from reading Chris Carosa’s From Cradle to Retirement anytime you want? Click here to purchase the Chris Carosa’s From Cradle to Retirement directly from Amazon. Click here to purchase the Chris Carosa’s From Cradle to Retirement directly from Barnes & Noble. Click here to purchase the Chris Carosa’s From Cradle to Retirement directly from The Book Depository (free delivery worldwide). Click here to purchase the Chris Carosa’s From Cradle to Retirement directly from CEO Read for bulk orders (when available). Click here to purchase the Chris Carosa’s From Cradle to Retirement at your nearest retail outlet.